The WX5FWD SKYWARN™ team are volunteer radio operator liaisons for the Fort Worth National Weather Service (NWS) North Texas SKYWARN™ Spotters. During SKYWARN events, you are reporting information to our team and the NWS warning forecasters. Three goals of a storm spotter are to safely observe, identify and report conditions. Weather spotters provide what's called "ground truth" to the National Weather Service and emergency weather management. Spotters are needed because, while radar is very good at helping the National Weather Service see what's going on in the upper atmosphere, it's unable to detect what's actually happening on the ground because of the curvature of the Earth. Knowing the "ground truth" about a weather event from the location can be the deciding factor to issue a warning. Bob Henson | 11 March 2010 • The biggest upgrade to the U.S. weather-radar network in 15 years gets rolling this winter with a minimum of fanfare—debuting under the radar, as it were. But the new capabilities should get their fair share of attention in the long run. Hole Punch Clouds are simply high clouds that look like somebody punched a hole in them. 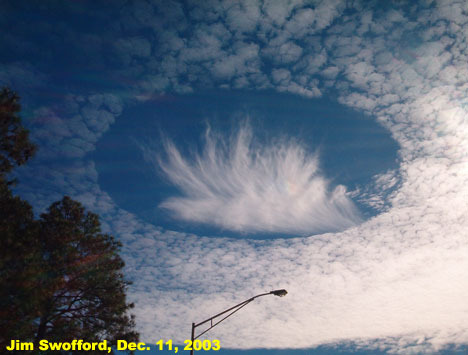 The name is not scientific and sometimes you hear it as Punch Hole Clouds but they look unusual. If you look you could probably see them fairly often when we have Cirrus clouds but usually they are not too dramatic. On December 11, 2003 the sky was dramatic over Mobile County, Alabama. Washington County, Alabama later saw a similar event on January 29, 2007. Read the story at Hole Punch Clouds. NWS Fort Worth is on Facebook! The Texas Thunderbolt - Spotter Newsletter is published from the NWS Preparedness and Storm Spotter Information page.